All gifts will be recognized. a permanent display at the stadium. We have raised $14,249,561.00 of our goal. 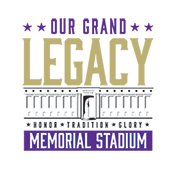 With your monthly pledge, we can renovate Memorial Stadium to preserve its history and assure it will continue to serve our students and the Grand Island community well into the next seventy years. Thank you in advance for your vision and generosity. In order to process a recurring payment, you must select Yes above.